VW’s beloved bus is coming back. 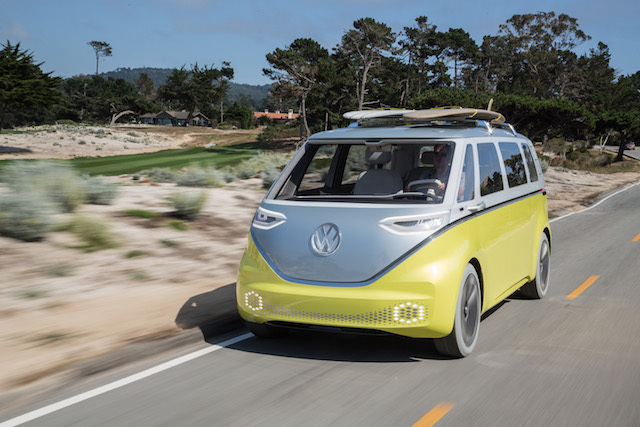 Mark your calendars: this electrified VW bus is slated to arrive in 2022. One of the most iconic vans in automotive history is the Volkswagen Bus or Volkswagen Type 2, introduced in 1950 and popularized in the 1960s. Long before the minivan craze began in 1983, Volkswagen claimed the market all to itself. We’ve seen various Volkswagen vans since, including the VW Routan, a rebadged Chrysler Town & Country. That Volkswagen hasn’t had its own entry in the US market for ages has disappointed some, but that’s soon to change as the VW I.D. Buzz Concept —- introduced at the 2017 North American International Auto Show in Detroit -— has been approved for production. Sliding doors provide ease of access to the rear compartment. Volkswagen waited until all eyes were on the Pebble Beach Concours d’Elegance this weekend to make the announcement. The new model arrives is scheduled to arrive in 2022 or after the cop act four-door I.D. debuts. the size of some large SUVs. Indeed, the new model will make a clean departure from all VW buses before it by relying on battery power only. 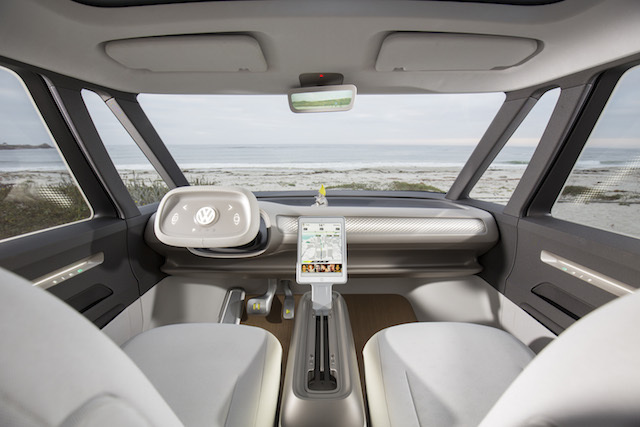 Volkswagen says the batteries will be mounted in the vehicle floor with the remaining major electric components — electric motor, power electronics and so forth — requiring only small space. Thus, the I.D. Buzz will have interior room similar to what a large SUV offers, although the footprint will be decidedly compact. Notably, the new model should supply a 270-mile electric range, rivaling certain Tesla models and outpacing the Chevrolet Bolt. Further, the Buzz offers 369 horsepower, ensuring this people mover has more than enough power to go places. 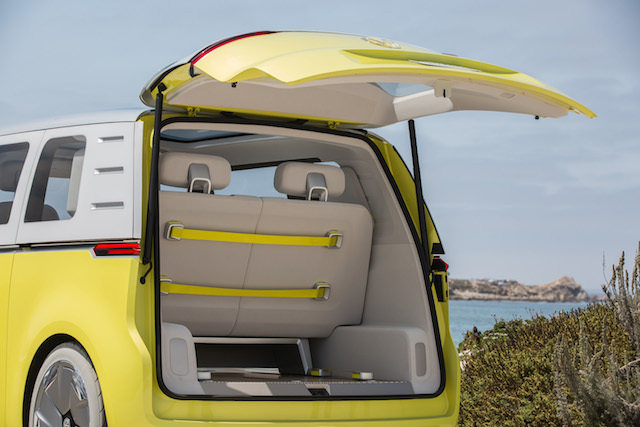 Sufficient standard storage space for this compact VW people hauler. Volkswagen plans to offer a cargo variant as well, for what the company says will be “for the zero-emissions delivery of goods.” Auto Trends will supply updated information about the new VW model once those details are made known. The Bottom Line — Volkswagen is doing everything in its power to put some distance between where it is headed — electric vehicles — and its dirty diesel scandal past. Importantly, VW is also listening to consumers who requested the I.D. Buzz Concept and that’s a big change for a company not always in tune with customer feedback. 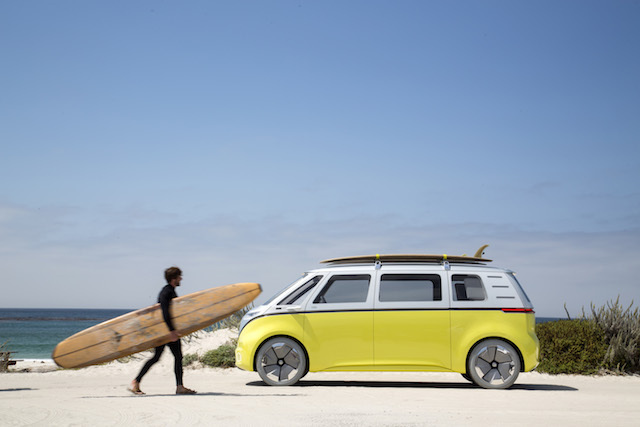 Although designed with contemporary shoppers in mind, Volkswagen promises that its new generation “bus” will still appeal to the same kinds of consumers who prized the original early on, including surfers. California surfing, here we come! 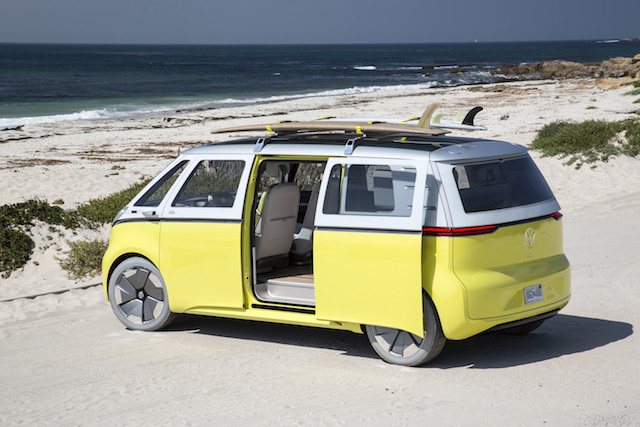 Photos copyright Volkswagen of America, Inc. All rights reserved.